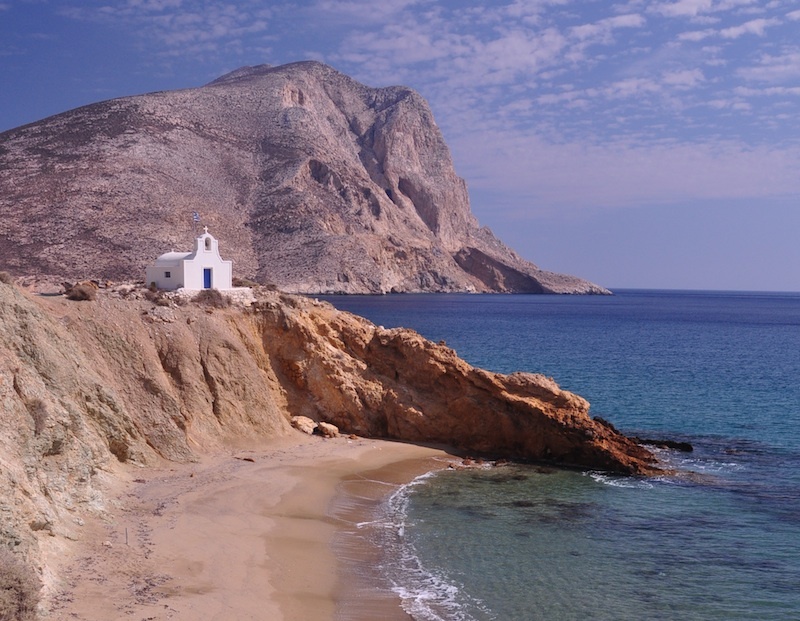 In legend, Anafi emerged from the sea at the behest of Apollo, in response to prayers from the wandering, storm-tossed Argonauts for a convenient landfall. It is a small, roughly triangular island; its southerly base, lined with excellent beaches, tapers to an eastern extension, Mt Kálamos (460m). This dramatic monolith, visible from many points on Anáfi, is claimed to be the largest such rock formation in the Mediterranean, exceeding even Gibraltar. In my first two attempts to visit Anáfi, in 1978 and 1986, I was prevented from doing so by mendacious rent-rooms proprietors on Santoríni – both times with the same fable, “there’s no boat to Anáfi today/tomorrow” – when in fact there was. I was spurred on in part by a semi-apocryphal travellers’ tale about a party of backpackers who overslept their desired landfall on Santoríni, only to be led off the ferry at Anáfi, at 2am, by a veteran visitor who happily proclaimed, “This is a better island anyway”. Which in many ways it is. I finally made it for the first time in May 1994, and ended up staying a day or two longer than planned. Back then it had a reputation as a retreat for Greek and Austrian hippies, who camped rough behind those beaches for weeks or months at a stretch. The only proper road (and bus) on the island linked the port with Hóra; if you wanted to go anywhere else, you took a boat, or walked. Around the millennium, a road was finally opened towards eastern Anáfi, but thankfully without harming most of the trail system – walkers are still actively catered to on Anáfi, with ubiquitous black-lettered wooden signs and placard-maps, while KTEL buses/taxi-boats only function in peak season. When I finally returned in autumn 2012, the Anafiots had just enjoyed their best tourist year ever – something like 14,000 visitors, of varying nationalities, competing for barely 500 beds. They included innovative Greek musicians Kristi Stassinopoulou and Stathis Kalyviotis – it’s their favourite island – whom I bumped into entering the ferry just as I drove off it on my scooter. These enhanced numbers had much to do with the fact that Anáfi is no longer the island-hoppers’ dead-end that it was for so many years. Since 2008, there are two or three weekly links each direction between the rest of the Cyclades (Santoríni is the closest, 90 minutes distant), and Crete/the Dodecanese. This is a subsidised, government-mandated service which should persist in future seasons, but in Greece you never know. Those thousands of visitors contrast with a permanent population of about 250. In winter, the thirty or so school-age kids are bored senseless, there can be ten days between boats (even longer intervals for doctor visits), and the landmark pair of flattish rock-islets offshore are often completely submerged by angry seas. That said, local life is not nearly as harsh as it was in 1966–67, when anthropologist Margaret Kenna did her dissertation study here, commemorating her residence in the recommended Greek Island Life: Fieldwork on Anafi. Disregarding the negligible port settlement of Áyios Nikólaos, hilltop Hóra – reached by a winding 4-kilometre road, or a steeper but shorter path – is the only significant habitation, home to most accommodation and tavernas. The south-facing village is roughly egg-shaped in layout, looking out to sea – not quite all the way to Crete, but almost – and the same vaulted, earthquake resistant architecture as on neighbouring Santoríni. The prehistoric volcanic eruption there has coated Anáfi’s basic granite/limestone core with a considerable layer of pumice and other volcanic debris. There are about ten rented-rooms places here; the best sited ones are at the quieter south rim, with uninterrupted views. I stayed happily at Maroulia (tel 22860 61307) – just four units, a bit on the basic side but extremely friendly and open all year. They make their own strong (13.5% alcohol), excellent white wine. The Ostria (tel 6973 305313), right next door, has slightly higher standard rooms, with the same views. Over on the east edge of Hóra, Ta Plagia (tel 22860 61308, www.taplagia.gr) comprises a row of garden-set bungalow studios, again with views though also the main access road just behind. Eating out, Liotrivi (tel 22860 61209) is the place for fish, along with Santorinean bulk wine and and a few vegie starters. Seating is in the vaulted interior, or out on the small, exceedingly popular terrace. They shut, like most everything else here, off season. I ate consistently at To Steki (tel 22860 61380) in 1994, and they’re still going strong – they closed just before my 2012 visit owing to a birth in the family, but should reopen by spring 2013. I was treated rudely at Alexandra’s, so can’t recommend it. But the little grill-house To Sokaki is excellent, with tables out in...the sokáki (alley in Greek). Nightlife consists of a few café-bars, the most consistently open and classiest being Pou Pas Karavaki, with a reliable wifi signal. The proprietress rejoices in the bizarre name Rambelia, restricted to the southern Cyclades. Apparently it’s a corruption of an obscure French philhellene. Of Ágios Nikólaos there’s little to be said, other than the presence of a single casserole-dish taverna, To Akrogiali tis Popis (tel 22860 61218) – tasty, if a bit on the pricy side. From just inland, a path heads east to Klisídi, Anáfi’s handiest beach; a side-road also goes there, from much further up the main road to Hóra. It’s a lovely spot, with a romantic palm tree just inland, plus a selection of places to stay and eat. Artemis (tel 22860 61318) is effectively right on the water, while Maragarita’s (tel 22860 61237) rooms are equally good, attached to the most consistently open taverna here – fried fish, keftédes, ouzo-mezé, ice cream. Beach here too crowded? Walk east fifteen minutes over the headland to sandy Katsoúni, equally long, with nudism tolerated. On the hillside above Klisídi is Anáfi’s best – well, lone – hotel, the Apollon Village (tel 22860 28739, www.apollonvillage.gr; May–Sept only), and probably the only local establishment you could pre-book through our recommended travel agencies. Its tiered, mock-trad bungalows overlook the beach, and the landmark monolith, with a good level of privacy for their terraces. The upper trail system starts just east of Hóra, prominently signposted with accurate elapsed times. The little irrigated farms along here on the south coastal plain contrast sharply with the harshness of Anáfi’s upper slopes. 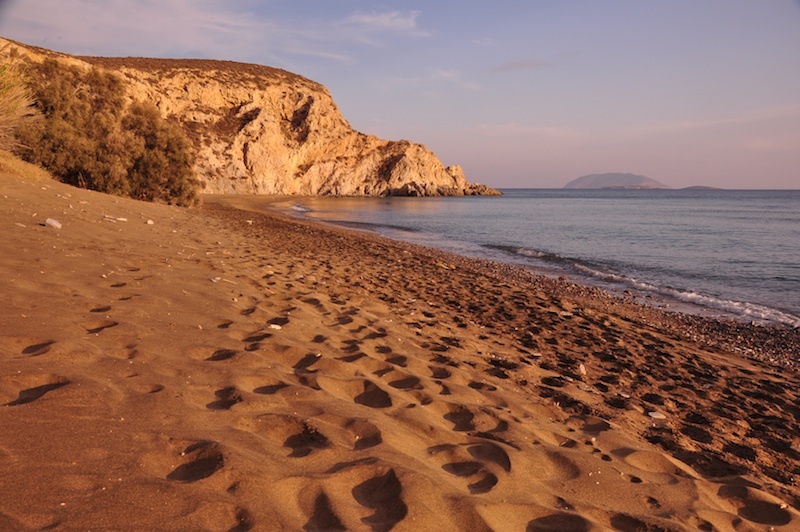 The first major stop, 50 minutes along, is Roúkounas, at 500m the island’s longest beach, with plenty of rough camping under the tamarisks (plus seasonally available toilets and showers). Just inland is the island’s only remote taverna, known informally as Tis Papadias (Of the Priest’s Wife), also with a few rooms to let (tel 6947 090469). They specialise in average-priced casserole dishes like briám. Beyond Roúkounas, you arrive at the various coves known as Katelímatsa, of which the most scenic has to be Ágii Anárgyri, named after the iconic chapel just overhead. It comprises about 70 metres of tan, cliff-backed sand, and could fit about eight people at a pinch. Beyond here, both trail and road skim above Monastíri beach, not nearly as good and where nudism is forbidden owing to line-of-sight contact with Zoödóhou Pigís monastery, 2hr 20min walk from Hóra. 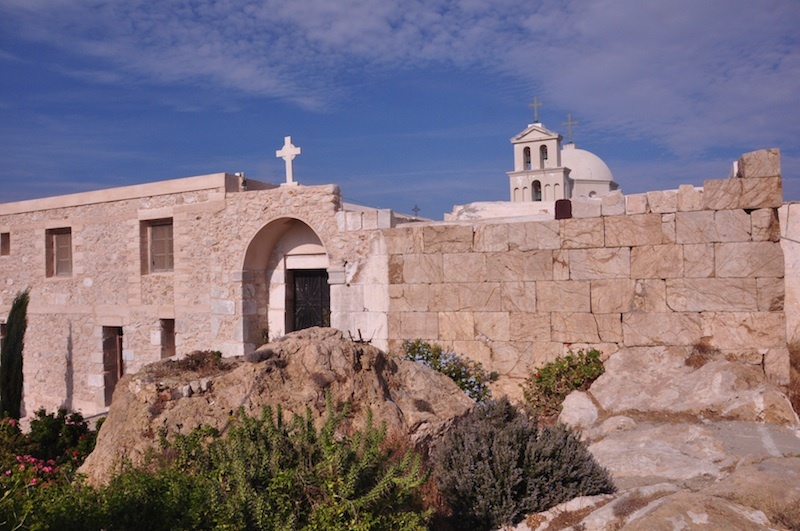 Zoödóhou Pigís monastery (open 11am–1pm & 4–6pm, until 7pm in summer) is among the oldest in the Cyclades – a tenth-century AD foundation is claimed. But its predecessor on the site, an Apollo temple perhaps founded by the grateful Argonauts, is far older, and extensive stretches of its masonry are incorporated into the monastery walls. Fetching frescoes along the entry passageway have been done since the year 2000. The abbot comes and goes between here and Santoríni, leaving in charge a surly resident caretaker – the only unfriendly person I met on the island. But the main point of coming all the way out here is to make the climb of Kálamos, along the clear path signposted at the north corner of the monastery perimeter. It says ‘1hr 15min’, but it’s actually more like 50 minutes – an hour with pauses. In autumn dense swarms of flies annoy, but clusters of lovely purple and yellow croci on route more than compensate. There is no chance of getting lost, or of falling off the mountain. 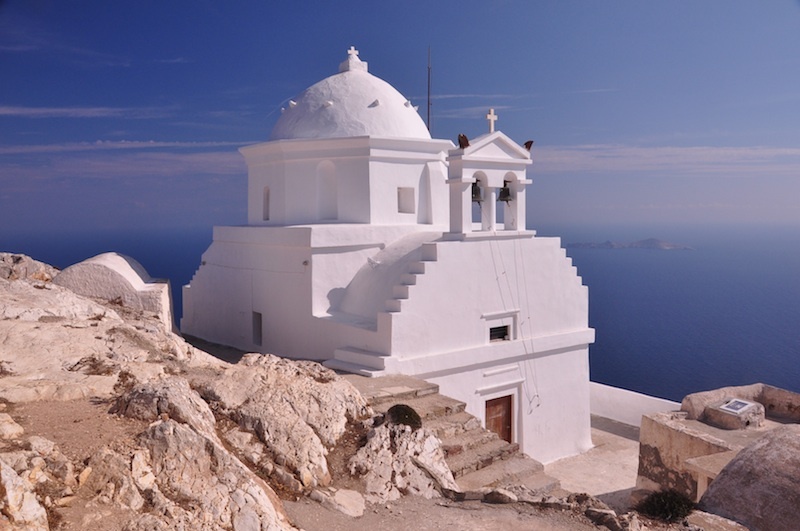 Up top, besides the expected stunning views over isles and sea, is the stereotypically Cycladic, 18th-century monastery of Panagía Kalamiótissa (locked except at the 8 September festival-top photo). It used to be quite a thing for hippie devotees of Apollo to haul sleeping bags up here and watch the sunrise, and for all I know folk still do it. But you’ll need to bring all essentials with you – one of the water cisterns was accessible in 2012, but better not count on that. It takes 45 minutes to descend to Zoödóhou Pigís. The best commercial one is Terrain’s 1:15,000 “318 Anafi” (see e-shop.terrainmaps.gr). As stated above, there have in the recent past been two to three weekly long-haul ferries connecting Anáfi with Piraeus, select other Cyclades, Crete (Iráklio and Sitía) plus Kássos, Kárpathos, Hálki and Rhodes. ANEK (www.anek.gr) is set to continue this service in 2013. There are additionally small local milk-run ferries like the Artemis and Aqua Spirit which go to/from Santoríni, Folégandros, Sýros and the like. Do you enjoy using my site? Have you found it entertaining as well as useful? If so please show your appreciation by booking hotels through the travel agencies and the links found on my Travel Agents Page. The small comission I make on the bookings enable me to keep working and in most cases you won't find them any cheaper by searching elsewhere. 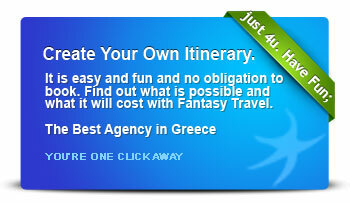 You can also book at Booking.com's Greece Pages and they give me a small percentage on each booking.